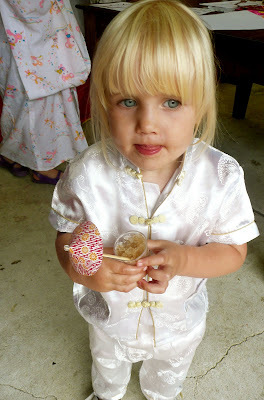 On Wednesday we celebrated Goose’s 7th birthday in Japanese Style! Please indulge, once again as I share too many details. I just know that when I am roaming the web for inspiration for my parties, I like as many details as possible. My name is Emma and I am addicted to kids parties. Once again, I will break it into a few different posts. Here are some quick snaps of the food. It was fun to branch out from our usual party fare and try some different things. I was a little nervous the kids wouldn’t eat much of it, but most of it disappeared. Thankfully not all of it though as I always like to make a little extra so that we can have leftovers for dinner that night! Sushi sandwiches – made by Lou – how to make your own here. Party pies with Australian flags on toothpicks – it was Australia Day after all! 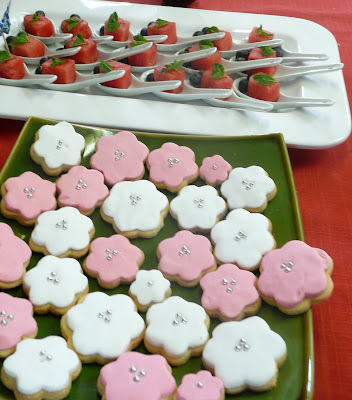 - ie.watermelon, honeydew melon & rockmelon cut in flower shapes with cookie cutter. Birthday Cake – Cupcakes with Paper Cranes - tutorial here. - using the favorite shortbread recipe of course. Just because she is cute. 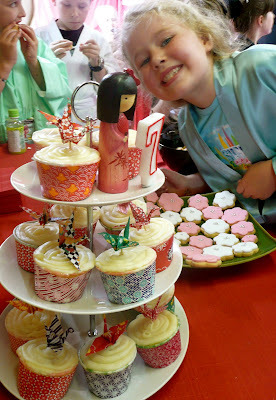 - The little flags on the toothpicks said Happy Birthday in Japanese and were free printables from here. * Deliciously morish chocolate dipped biscuit sticks that can be purchased at Asian supermarkets or sushi bars. ** Purchased at Asian or regular Supermarket. I’ve seen these dipped in melted chocolate & covered in sprinkles and they look very cute. These were the most popular with the kids. Love the food. Those cherry blossom biscuits are divine. So glad all went well with the party! 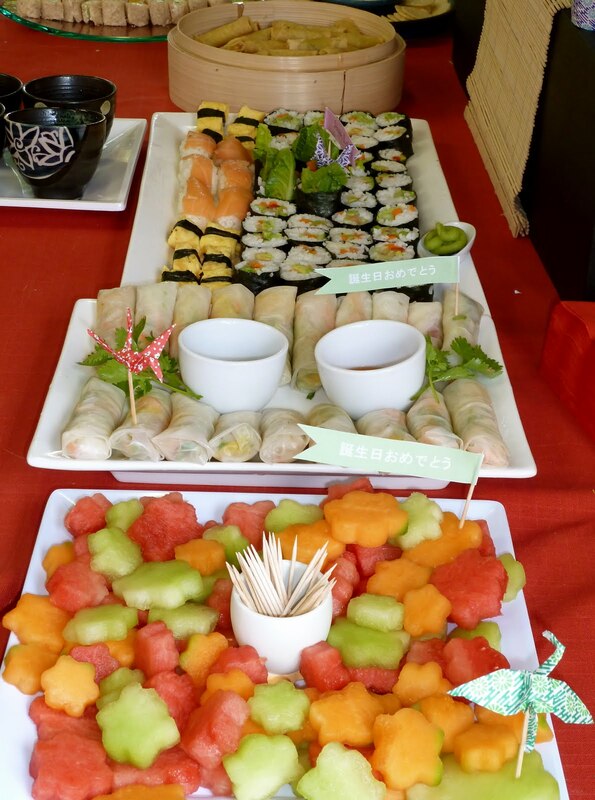 Your sure know how to hold an amazing party in your family!<br />It all looks amazing, you are making my mouth water.<br />I never did get around to doing a tute about making nori rolls, I have the photos, just need some time. Your hubby sure made some yummy looking ones!<br />Oh, and Happy Birthday Goose! Just gorgeous! Fantastic effort. Well done. Great job! I love it all Thanks for sharing. So many goodies here! Really inspirational!